Some people who read this next post may give me a big collective “duh – how did you not know that! ?” But I feel like I really need to make this public service announcement to all new parents out there who might be as naive as I once was. If this changes just one parent’s life for the better than it was worth it. So here goes: Don’t freakin put your kid’s lost tooth under their pillows for the toothfairy to find!!! 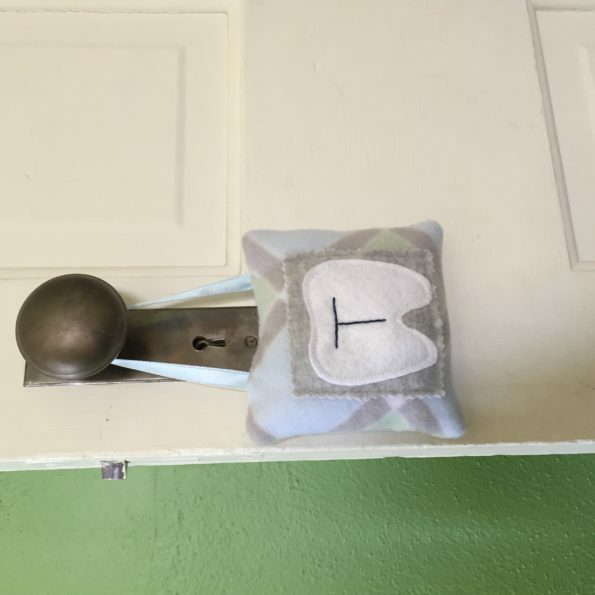 Make a tooth pillow, a bag, a dirty sock or something else , ANYTHING else to hang from their doorknob. I wish I had learned this sooner. When my first child lost a tooth I got all caught up in the romance of the tradition of placing that tiny little nugget under their pillow. I was so excited. Little did I realize at the time how many nights I would be playing wannabe ninja trying not to breath to loud next to their face as I precariously dug under their pillow with a flat hand to pull out the crinkly ziplock bag (yes I thought I was being clever when I first suggested putting the tooth in a zip lock bag with a sound decibel reading of what has got to be close to a jet engine’s when its dead quiet) and then have to shove my hand back in the with money in yet another zip lock bag. Insert palm to forehead emoji here. After realizing the errors of my ways with my daughter I tried to suggest switching our method to her but she was having none of it and had already infiltrated the minds of her little brothers. About two weeks before Christmas this year I was at panic level when she lost TWO molars in a week. She still believed in Santa. I knew that if I blew the tooth fairy cover that close to Christmas the whole jig was gonna be up. It was probably going to be the last year of belief for her and if I screwed that up there would have been wailing and tears and she would have been pretty darn upset too! Those two nights I tucked and rolled and recreated moves from my childhood teenage mutant turtle pretend playing days (what can I say I grew up on a farm and my playmate was my older brother) as I held my breath longer than I ever have until I had the tooth safely in my possession and was standing outside her door. Also I would just like to say that it is really easy to forget about that dang little tooth hiding under their pillow when you are dragging yourself to bed at the end of the day. Some tooth fairies – I’m not saying this tooth fairy- can forget from time to time. (Although a pack of gum with their coins usually makes up for that – there’s another tip for you. Your welcome.) A visual reminder on the door would be very helpful. So this has been my life for the last oh 4 years. When my third son lost his first tooth recently I was understandably excited for him but less so for myself. However, little did I know that my son’s inability to sit still even in his sleep was going to be my ticket to a change in the tides. You see that night we had slipped the the jet plane sounding zip lock bag under his pillow safely however when I crept into his room later that night I found my son in what was probably his third counterclockwise full body rotation on the bed with the tooth wedged underneath him. This was my chance! I could gamble waking him up on his very first visit from the tooth fairy or I could leave it and change the course of my tooth fairy life. 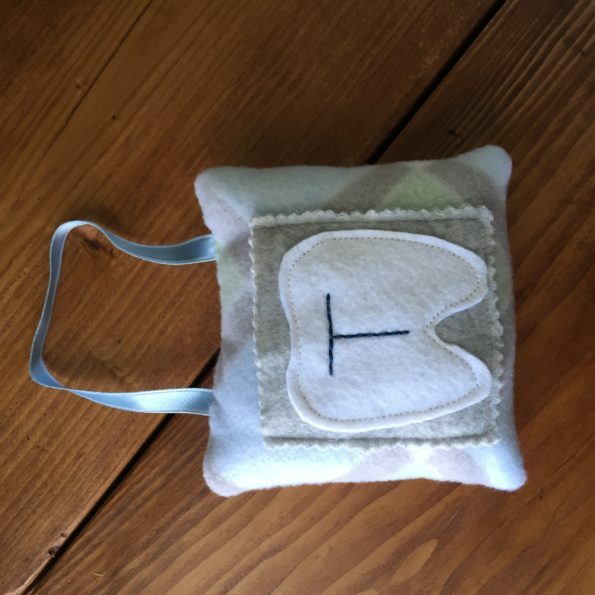 I chose the latter and although I had a dissappointed boy in the morning it made it extremely easy to talk him into letting me make him his very own special tooth hanger so the tooth fairy could easily find his tooth the next night. That night the tooth fairy effortlessly exchanged that adorable baby tooth for a crisp new dollar – as well as a pack of gum for making her life a whole lot easier. If this golden nugget of tooth fairy knowledge has helped you at all then go my tiny tooth fairy trainees shout it from the rooftops. Let us lay down the black ninja spandex – which is not a good look for many of us and quite honestly probably uncomfortable as well. P.S. my daughter still has not changed her stance in the traditional placement of the lost tooth. The good news is she only has two more teeth left to lose and then I can burn my black ninja spandex. Tooth hanger designs are now in the works for my other two boys! P.P.S Just to clarify I don’t actually wear black ninja spandex. That was just a metaphor. My children would probably be more scarred to wake up seeing me in a spandex jumpsuit than to find out I’m the tooth fairy.